Our fleet of private cars and taxis are available 24 hours a day, 7 days a week. Online or from our iPhone or Android app. Track and relax until we pick you up. Payment directly on your phone. No cash or paper receipts. We are located in the heart of St Albans (AL3 4PQ). We have the best online booking system and mobile app. Travel can be fraught with inconvenience, discomfort and even safety concerns. St Albans Drivr changes all that. Our professional, polished drivers, modern vehicles and state of the art smartphone app ensure that you enjoy a seamless, positive experience whether you're traveling into town for shopping, or heading to the airport for your holiday travel. Our goal is to provide not only exemplary taxi service, but to ensure that you experience the utmost in comfort, convenience and peace of mind. To achieve that goal, we offer a number of features. We are proud to be the top-ranked St Albans taxi service, and we maintain that distinction through a commitment to outstanding quality. Low, Flat Rates: We never charge you variable rates. Book your transport now and get a low, flat rate for your travel. No Congestion Charges: While other taxi services might charge you an additional fee for congested roadways, we believe that's wrong. We never charge you for road congestion. Professional, Trained Drivers: Our drivers are at the top of their game. They're professionally trained, unfailingly courteous and dedicated to ensuring your comfort. Modern Vehicles: Our entire fleet is thoroughly modern, and constantly inspected for safety and performance. We have developed a cutting edge smartphone app (iOS and Android) that can be used on your mobile device. Need transportation immediately? Just use the Drivr app. Log in, request transportation and then choose the type of vehicle you prefer. 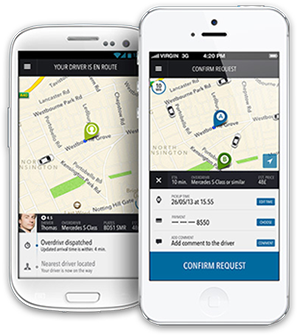 You can even track your driver's progress to your location, and then afterwards while in transit. After you've been dropped at your destination, rate our driver's professionalism, courtesy and your overall experience. Of course, you can also use our app to schedule transportation ahead of time. Just log into the app, enter the pickup address and the drop off location, and then the date and time you need to be picked up. Choose the type of car you want, and you're set. We handle the rest. Our app also provides a number of additional features that offer peace of mind and heightened security. Don't fuss with cash or struggle with paper receipts - pay directly from the app and we'll email you the receipt immediately. State of the art encryption keeps your personal and financial information secure, while offering significant convenience. We're proud to be the top choice for Luton Airport Taxis service. Whether you need transportation from your home into St Albans or you require airport taxi service, we're here for you. Let us show you how comfortable and seamless taxi transportation in and around St Albans can truly be. St Albans Drivr managed to get us to the airport in good time, despite road congestion. Comfortable, well-appointed cars, too. Booking with St Albans Drivr means you're in safe hands. We provide a low cost airport transfer service. Make us account of your ride.